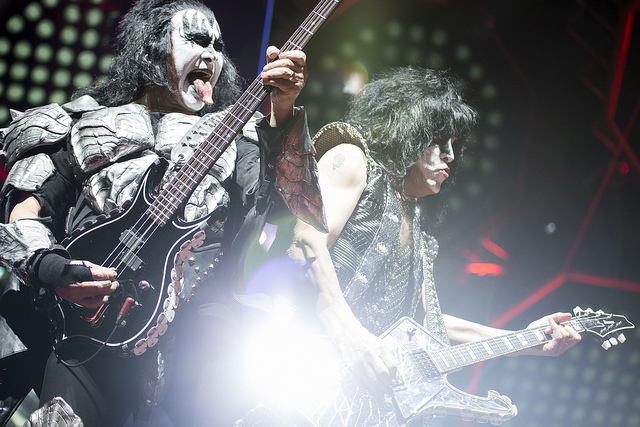 KISS kissed Milwaukee goodbye Friday night. Published March 2, 2019 at 10:01 a.m. The days of rock and rolling all night and partying every day are coming to an end, as KISS' "End of the Road" farewell tour rolled through Fiserv Forum on Friday. The bittersweet performance checked all the boxes for a memorable KISS concert and gave the band's Milwaukee fans a proper goodbye, in a city where the rock legends have a long 45-year history of live performances. 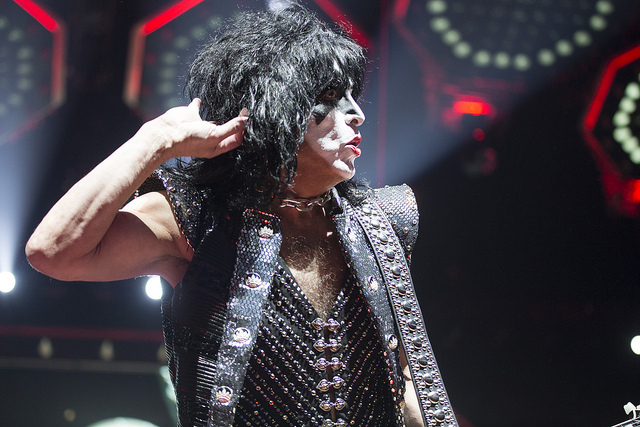 From Gene Simmons breathing fire to the Catman, Eric Singer, performing "Beth" on a grand piano for a teary eyed crowd, Friday night's performance had no shortage of highlights for KISS' last hurrah on a Wisconsin stage. You'd be hard-pressed to find a band with a greater history of Milwaukee performances than KISS. Currently comprised of founding members Paul Stanley (the Starchild) and Gene Simmons (the Demon), as well as lead guitarist Tommy Thayer (the Spaceman) and drummer Eric Singer (the Catman), the face-painted quartet has been taking its live show to Milwaukee since the '70s. Friday night the band added one last stamp to their Milwaukee passport by performing at the brand new Fiserv Forum. From shows at the MECCA in the '80s, multiple appearances at Alpine Valley, the Bradley Center and Summerfest, as well as memorable sets at the Riverside, the Milwaukee Auditorium and more, KISS has a history in Milwaukee older than a lot of the fans in attendance last night. 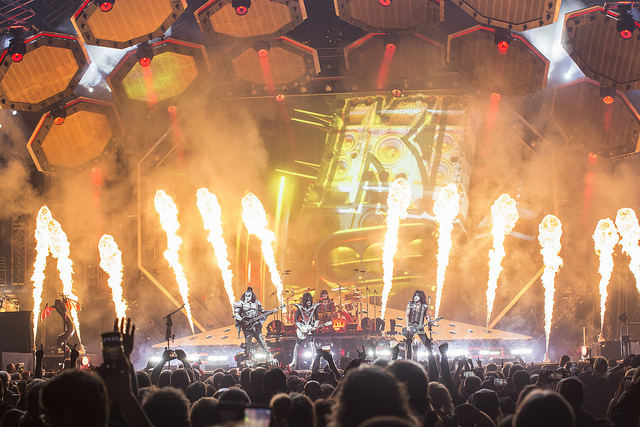 KISS' run in Milwaukee is unmatched by any other rock band of their caliber, and after Friday night's farewell, everyone else will now have a chance to finally catch up. "Alright, Milwaukee. You wanted the best? You got the best. The hottest band in the world, KISS!" An introduction known so well by Milwaukee's chapter of the KISS Army, fans heard those words likely for the last time on Friday while they enjoyed KISS' famed opening performance of "Detroit Rock City" from their 1976 album, "Destroyer." A perfect way to kick off any KISS concert, "Detroit Rock City" is not only one of the band's biggest hits but its live performance represents everything that makes KISS great. It's flashy, it's rockin' and it has the energy and showmanship that made KISS a household name four decades ago. 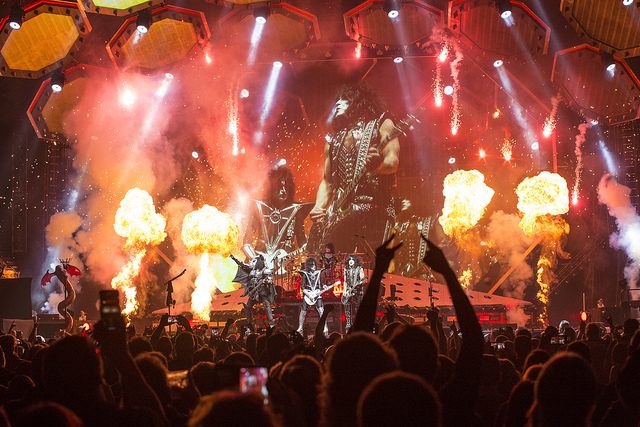 Instead of changing their introduction from tour to tour, KISS took the "if it ain't broke" mentality and turned their "Detroit Rock City" performances into an iconic opening. With fireworks, pyro and Gene Simmons sticking out his tongue, "Detroit Rock City" gets fans to the arena on time and is one of the only Detroit-related things that Packer nation can get behind. After a few concerts at the Fiserv Forum that were relatively tame on the production side, Travis Scott's Milwaukee tour stop came off as a high-cost production masterpiece when compared to those before it. That all changed to some extent on Friday when KISS brought its live show to town. With more fireworks than the lakefront's Big Bang and enough fire to burn the roof down, KISS' show made Travis Scott's performance look like an Adele concert. Friday night highlighted the subtle but huge differences between a concert and a show. 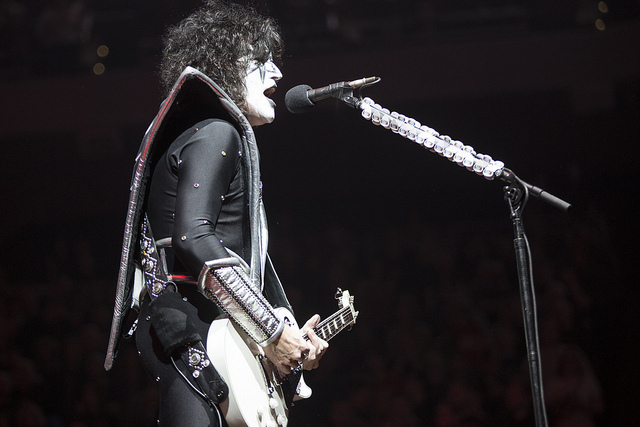 Of course, without the music and decades of hits, fans wouldn't have came out in large numbers to see Paul Stanley and company perform, but the band's massive production, over-the-top costumes, giant stage, platforms that rose to the sky and endless supply of pyro made the show a real treat for the eyes. KISS spare no costs when it comes to putting on one of the greatest rock shows on the planet. 4. 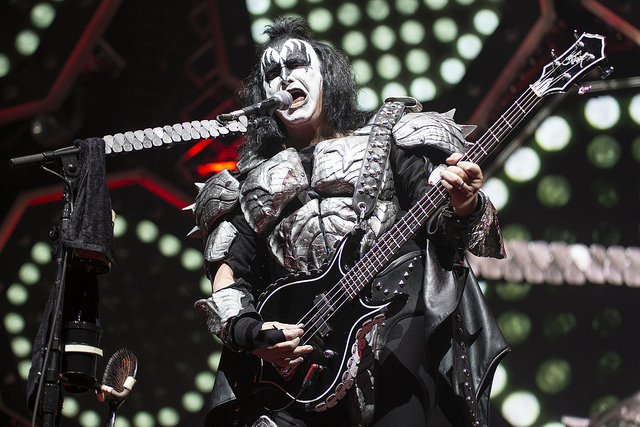 Gene Simmons breathed fire for "War Machine"
Don't tell Gene Simmons that he's nearing 70 years old. He won't believe you and neither do I. Not only does Simmons deliver the energy of a college kid, but he takes on risks for the sake of the show, unhealthy for a rocker of any age. The Demon puts it all on the line during the band's performance of "War Machine" from their 1982 album, "Creatures of the Night." Taking on the demon's persona, Simmons yields a sword of fire, raises it into the air and breathes fire for the screaming crowd. 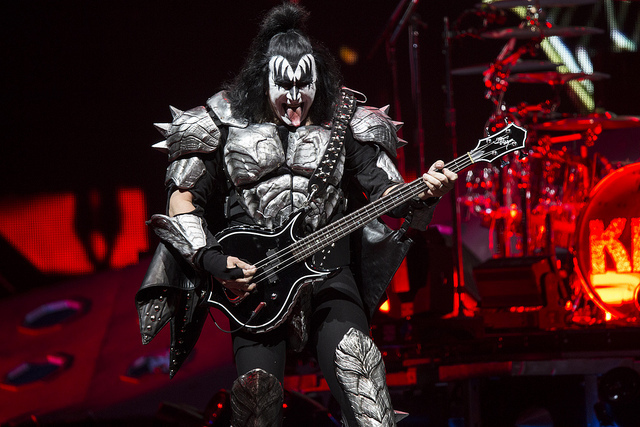 In fact, are we 100 percent sure the main behind the face paint is actually Gene Simmons and not a real fire-breathing demon? 5. Tommy Thayer's guitar solo on "Cold Gin"
Another highlight from Friday's performance came with Tommy Thayer's guitar solo on "Cold Gin." Since taking on the heavy lifting on guitar when joining KISS in 2002, Tommy Thayer also took on the Spaceman persona of founding member Ace Frehley, as well as one of Frehley's signature moves. During KISS' performance of "Cold Gin," a song that predates Thayer's time with KISS by over a decade, Thayer had the arena's full attention with his killer guitar solo while adding a bit of literal flare by shooting fireworks into the sky from the neck of his guitar, just like Ace Frehley in the '70s. Although Tommy Thayer isn't one of the band's founding members, today he is as an important of a member of KISS as anyone. 6. Paul Stanley ziplined over the crowd to perform "Love Gun"
After addressing the "good people of Milwaukee" and KISS' decades of performances in the city, frontman Paul Stanley decided to immerse himself into the crowd and ziplined from the band's main stage to a small B-stage surrounded by fans on the arena floor. 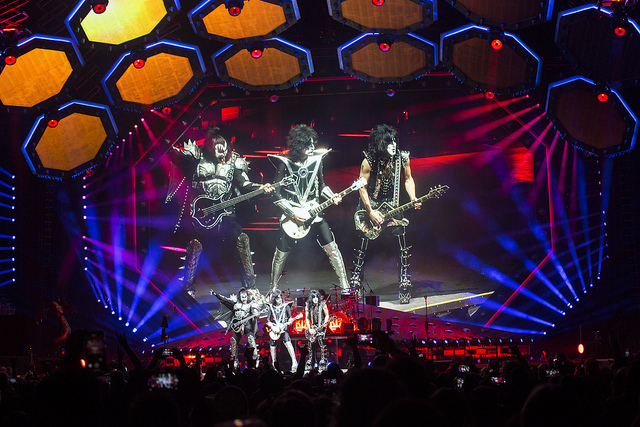 With fans all around him, KISS performed two of their most popular and suggestive singles, "Love Gun" and "I Was Made For Lovin' You," while fans had an up-close view of Stanley. While you'd expect the Catman to be good on his feet, drummer Eric Singer is a master of all sit-down instruments. After drumming away for the duration of KISS' regular set, full of upbeat rock songs, Singer opened the encore on the grand piano for KISS' most popular ballad, "Beth." Showcasing his vocals, Singer delivered an emotional performance of the song dedicated to missing lovers while on tour, which was originally released as a B-side to the set's opening track, "Detroit Rock City," before it became a hit single of its own. With fears of looking soft from their successful love song, the hard rockers quickly turned up the tempo and ended the night with an epic performance of their mega-hit "Rock and Roll All Night." As unimaginable amounts of confetti fell from the sky and Gene Simmons and Tommy Thayer floated above the crowd with crane-powered platforms, the performance ended in the most rock and roll way possible: by Paul Stanley smashing his guitar on the stage as colorful fireworks and flames lit up the arena. If you needed any other reason to see KISS live, Friday night was worth the price of admission because it was truly KISS' last farewell to the city of Milwaukee. Although the "End of the Road" tour isn't the band's first farewell tour, all signs point to it truly being their last farewell tour. With Paul Stanley and Gene Simmons both in their late 60s and with no new music to perform, all good things must come to an end. While KISS clearly has what it takes to put on a quality performance, there was a sense of finality in the air last night when Paul Stanley said his goodbyes – and what a grand finale it was!